I hope you don’t mind another day of orange and turquoise! 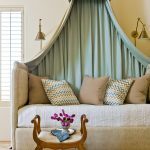 This posh bedroom designed by Lauren Guarcello of Porter Design Company and photographed by Peter Rymwid was in the Stately Homes By The Sea Show House in Red Bank, New Jersey. I love the fresh approach she took to the sophisticated room. 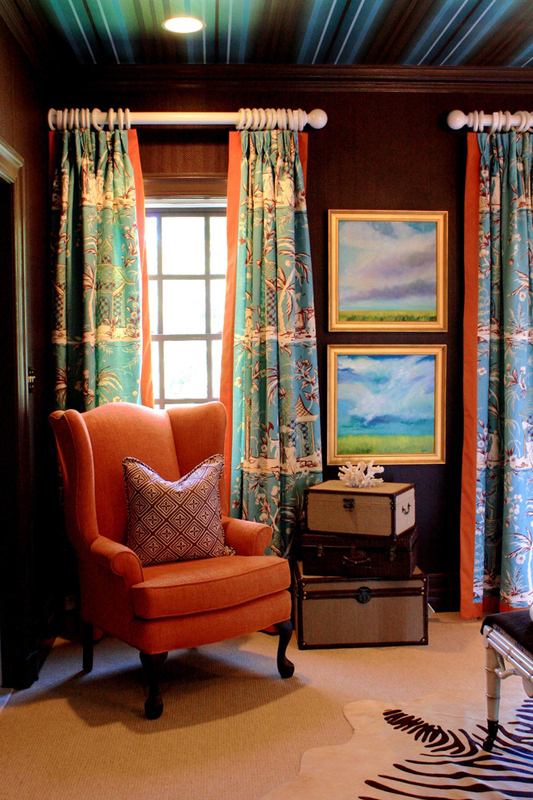 The China Seas Lyford Blue on Tint fabric from Quadrille is absolutely beautiful here and I just love the collection of turquoise paintings by Brisbane artist and designer Kerri Shipp of Driftwood Interiors. They just pop on the gorgeous paper weave wallpaper from Thibaut! Such an inspiring space! Oh, la, la! This is extraordinary! It's so unique! I usually prefer calmer spaces, but this one is surprisingly stunning. The designer really know how to work color and texture! This space is going straight in my inspiration files. Whoa is right! I always think I prefer lighter, more open and airy-feeling spaces. But this dark bedroom feels so cozy and relaxing. And, I never tire of turquoise and orange. Never. Thanks Erin for another stunning post to start my day. very daring to paint the walls that color, but I love it…and the pretty turquoise benches tucked neatly under the console table are just divine..beautiful decor.. I absolutely LOVE this post. 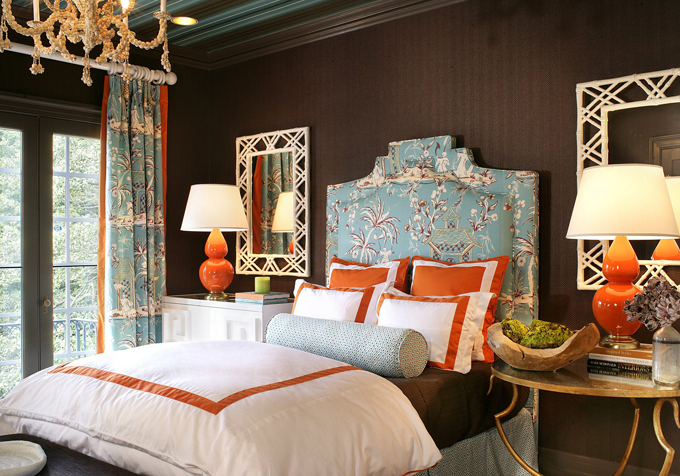 The contrast of dark and light is beautiful and the pops of turquoise make it amazing. Thank you so much for sharing. Wow. The chocolate walls really make the rest of the colors in the room pop! Very inspirational! Such a fun, luxurious space! I love the paintings done by Kerri, they are gorgeous. *gasp* more orange and turquoise goodness!! LOVE it! off to check out more of her stuff. Never gonna get sick of orange and turquoise. 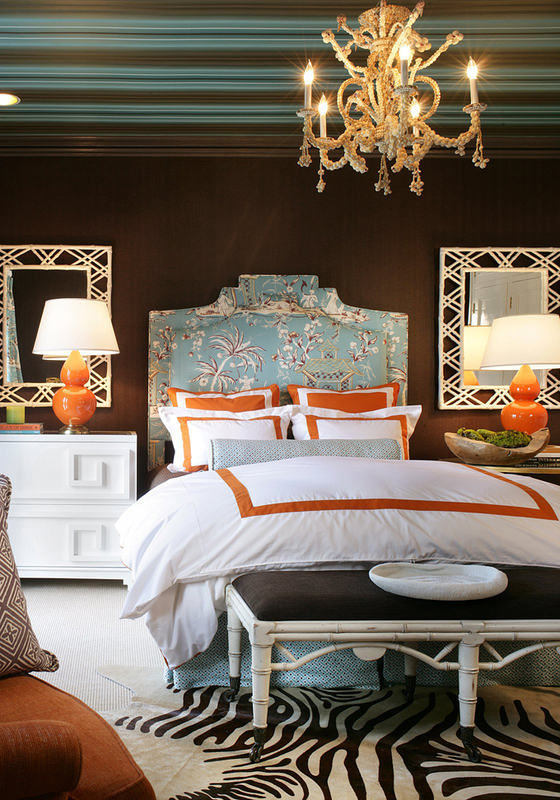 Please tell me if anyone knows where I can find that orange and white bedding! This room was stunning in person! I was fortunate to visit this earlier in the summer. In case anyone was wondering – that is actual a paper weave wallpaper! By Thibaut, of course. Herringbone Weave in Espresso from Natural Resource. Erin -thanks again for posting such loveliness! The turquoise and orange just gets better every day. Every thing in this room has a WOW! factor. Have so enjoyed this color combination. Thanks for the inspiration!! I have to save this room for inspiration, too. This room is drop dead gorgeous. And I love turquoise and orange. The chandelier is so beautiful. It makes the room sensational! Thanks so much for such a treat for my eyes. I have gotten so "into" the turq. and orange. Oddly enough, I bought a set of turq. and orange Tracy Porter pillows about 2 years ago. Didn't have one place to put them, but I just couldn't pass 'em up. 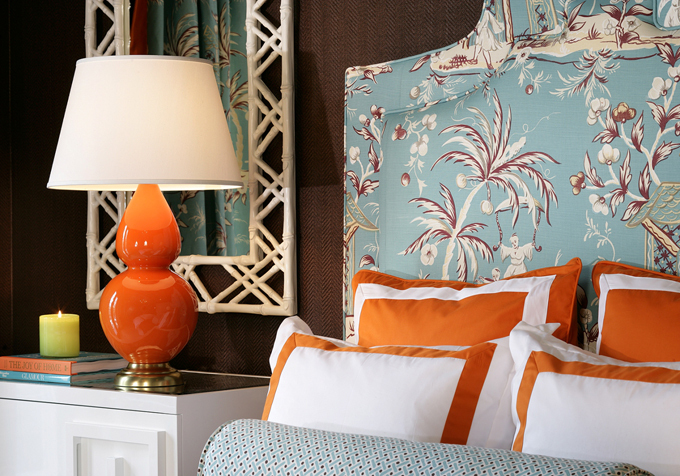 With the growing popularity in that color scheme, my bedroom will soon be a place to display those gorgeous pillows. I'm in the process of designing my new office in turquoise and orange and I'm love all of this inspiration!! Beautiful Room!! Oh … those ottomans! I MUST have them! Absolutely drinking it all in – especially Kerri's art, I'm a big fan. I NEED that bedding! Does anywhere know where it's from? The framed coral prints are beautiful! gorgeous! That shade looks perfect with the orange! It's like you went into my mind & plucked out a part I didn't know was there. I am in love with every aspect of this room. Wow. It's so typically Jersey shore. An awful lot going on here. Where did the white table come from? It's so simple and beautiful. Plus, ottomans underneath is such a great idea!